Are tensions boiling over? This is playoff hockey, after all. 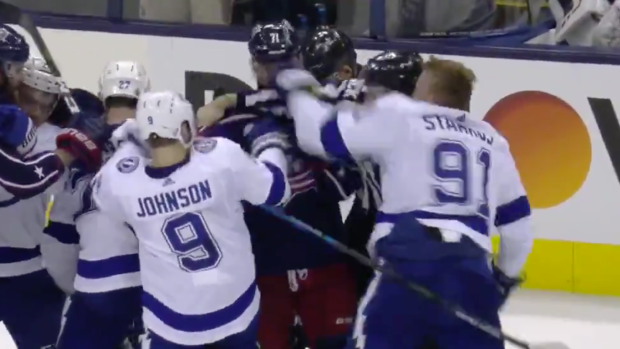 With less than a minute remaining, Nick Foligno and Steven Stamkos found themselves in a scuffle between whistles, and Stamkos threw a jab that the Blue Jackets captain did not like one bit. Speaking after the game, Foligno threw some additional shade towards Stamkos, and from the sounds of things, maybe we should expect some more extracurriculars come Game 4, as well. The Lightning will have their backs against their wall in the next game, and reality has come crashing down after they soared through the regular season. Jon Cooper is trying to take things one game at a time, but they’ll be playing for their season on Tuesday.